French scientist Gerard Liger-Belair works on a glass of Champagne in his laboratory, on September 13 in Reims, eastern France. 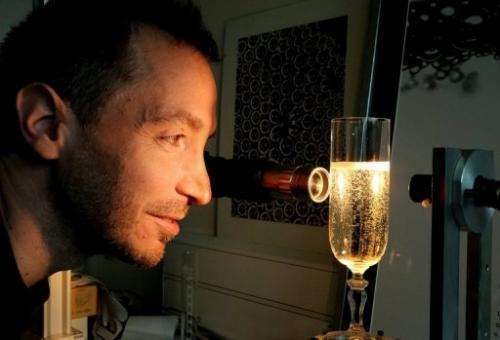 Teaching at the University of Reims, Liger-Belair worked with scientists Guillaume Polidori and Philippe Jeandet to find out the exact role of bubbles in the aroma and taste of champagne and engineered glasses to give measurable bubble flow patterns. Gerard Liger-Belair lives in a bubble, and he doesn't care who knows it. Bubbles are his passion. And they have given the 41-year-old French scientist arguably the best job in all of physics. In a lab supplied with top-notch champagne, Liger-Belair delves into the secrets of fizz: What gives this legendary wine its sparkle to the eye, its tingle to the tongue? A bottle of bubbly without the bubbles—all 10 million of them—would be a sad thing indeed, admits Liger-Belair. "It wouldn't be a very good wine," the scientist said in his lab at the University of Reims. "The heart of champagne lies in the bubble." Champagne is made under a two-stage, tightly-regulated process. First, it is made into a wine from grapes exclusive to the Champagne region east of Paris. Then a tiny quantity of yeast, plus sugar to feed it, is added. The bottle is stored upside down and rotated daily so that the fermentation deposit slides to the neck, which is then frozen, forming a plug of sediment that is then withdrawn. The bottle is secured by a cork and wire cage, and allowed to mature. When you pour a glass of it, you are also releasing a fluid with two million bubbles, which is where the fun science begins. "We have made discoveries that are really exclusive to champagne, things that have not been observed before," says Liger-Belair. How bubbles form, rise and cluster in the glass will determine the champagne's visual allure. As you bring the glass closer to your mouth, the bursting of bubbles at the surface will release tiny droplets to your face and aromatic molecules to your nose, adding a discreet, sensual feel. And when you take a sip, those bubbles will sculpt the "feel" of the wine—too many are unpleasant, too few are disappointing—and activate carbon-dioxide receptors on the tongue to send tiny signals of excitement to the brain. "Here's a sequence of high-speed pictures of a bubble that is about to pop on the surface of the wine," says Liger-Belair, pointing to phenomenon called a Worthington jet captured by a 5,000-frames-per-second camera. "It explodes, making a tiny crater on the surface. The crater closes up and then ejects a thread of liquid, which then breaks up in droplets that can fly up to 10 centimetres (four inches)." Using an ultra-high-resolution mass spectrometer in Germany to analyse the chemical structure of samples, Liger-Belair's team found that this effervescence is laden with "tensio-active" molecules, hundreds of them aromatic. Liger-Belair also figured out why strings of bubbles rise from certain points in glass. It happens when microscopic fibres—left by a kitchen towel or often just an airborne particle—stick to the side, allowing molecules of dissolved carbon dioxide to coalesce and form bubbles. The finding is important for champagne fans and the catering industry. Glasses that are retrieved from a dishwasher, where they have been washed and blown-dry upside down, could be so ultra-clean that—horribly—few bubbles form. Top-market glassmakers now use lasers to etch a tiny crown of spots at the bottom of the glass, creating flaws to make bubbles form and rise in a pretty ring. Champagne fans can make a few small scratches of their own—"no more, otherwise you have a huge degassing," says Liger-Belair—with a spiked tool. This year, Liger-Belair and colleagues issued a devastating verdict on a debate that had raged for hundreds of years. Should you drink champagne from a tall, long-stemmed glass, a "flute" in French? Or should it be a "coupe," the shallow cup that according to legend is moulded on the breast shape of Marie-Antoinette? Gas chromatography showed a "coupe" loses CO2 at least a third faster than a "flute." So unless you drink very quickly, you lose the precious effervescence. In similar vein, drinking champagne from a plastic cup can be a drab experience because the sides are hydrophobic, or liquid repelling. The bubbles adhere to the sides through capillary action and inflate into the size of tiny balls. Liger-Belair's work has been published in peer-reviewed journals aimed at fluid physicists and beverage specialists who deal with other sparkling wines, beers and sodas. In the Champagne region, it has been instrumental in helping winegrowers finetune the second stage of fermentation. The tradition was to add in 24 grammes (0.8 ounces) of sugar per litre (1.8 imperial pints) of champagne, but the trend now is 18 g (0.6 ounces), the lowest permissible under regulations, he explains. "People prefer smaller bubbles, possibly because this quality is associated with vintage champagne," the scientist says. "The easiest way to produce finer bubbles is to reduce the quantity of CO2 which is dissolved in the champagne, and this is linked to the amount of sugar." Liger-Belair says he has occasionally sparred with traditionalists who say too much physics will kill the myth of champagne. Champagne portrays itself as a small-scale, artisanal product, a wine of ancient knowledge and "terroir," a French word redolent of the soil. But Philippe Jamesse, head wine waiter at a five-star Reims chateau, Les Crayeres, says science and wine can go hand in hand. "When you see Gerard's work, you understand why the 'coupe' is completely out-dated," he says. "We don't have any here." So what does the scientist do with all the booze? Once the experiment is over, does he drink it? "By that time, it's warm and undrinkable. I think I must have thrown more champagne down the sink than anyone else on this planet."